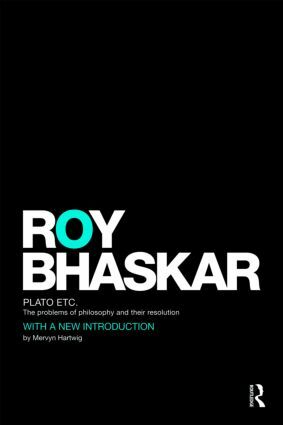 In this concise text, Roy Bhaskar sets out to diagnose, explain and resolve the "problems of philosophy". Plato Etc. reviews all the main areas of the subject: the theory of knowledge and philosophy of science; the philosophy of logic and language; the philosophies of space, time and causality; the philosophy of the social and life sciences and of dialectic; ethics, politics and aesthetics; and the history and sociology of philosophy. Among the issues discussed are the problems of induction and universals, the question of relativism, Heidegger’s "scandal of philosophy" (the search for a proof of the reality of the external world), the nature of moral truth and the conundrum of free will and determinism. The last two chapters consist of a synoptic account of the development of Western philosophy from the pre-Socratics to poststructuralism. Plato Etc. seeks to revindicate the philosophical project, and to demonstrate that the author’s "dialectical critical realism" has the categorical power to remedy the problem fields of philosophy. The book serves both as a critical introduction to philosophy and as an invaluable resource for the scholar.